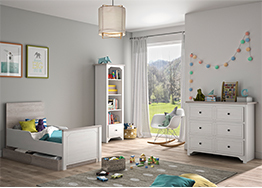 Our collections of baby and junior bedrooms and furnitures dedicated to toddlers. 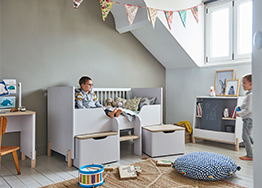 At galipette, we offer parents and future parents a line of furniture collections that adapt to their desires and personality. 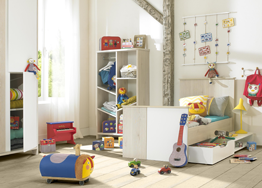 Decoration soft or tonic, trendy or retro, colorful or united, discover our universes and take pleasure in preparing the arrival of your toddler. “Et hop pour qui les Galipette ? 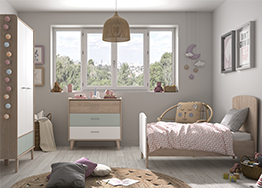 Soft yet distinctive, the Charly range is bound to brighten up baby’s room. 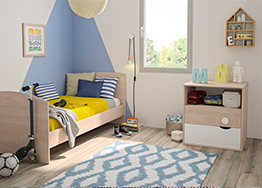 Opt for the Evan collection for a modern, elegant and timeless room for your child. For a nursery decor with a natural and contemporary feel. A soft and soothing dominant tone and a hint of color to differentiate! The graphics of the chevrons brings character to this timeless collection. 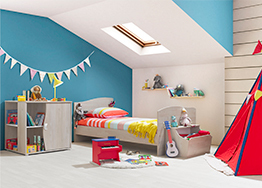 Decorate your nursery with a soft and tender two-tone range. 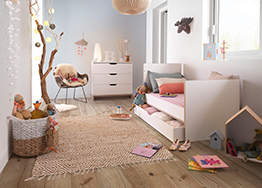 Lilo reveals a perfect blend of pure white with natural wood effects. The Pablo collection is available in 2 colours to perfectly match your room.